How do I enter the reserve price? Why does Transpact.com require me to list bank account details? Why does Transpact.com requests me to instruct a €/£/$0.01 money transfer when I create my account? The transaction appears as "live & protected" on Transpact.com - what does it mean? Why does Transpact.com require me to instruct a \u20ac/£/$0.01 money transfer to confirm that the funds should be released? I am a seller - Why does Transpact.com require me to instruct a €/£/$0.01 money transfer when listing my bank account details? I am a buyer - Why does Transpact.com require me to instruct a €/£/$0.01 money transfer to confirm that the funds should be released? How will I get paid by the buyer if I choose Escrow.com? The Artprice.com standardized market place only accepts original artworks “from” or “made by” the artist abovementioned. “Workshop of”, “school of”, “in the taste of”, “style of”, “in the way of”, “sort of”, “inspired by”; “technics of” are not accepted. 1/ consult the artprice.com databases: look up the auction results for the artworks by the same artist and similar to the one you hold that were put on sale at auctions. To get access to detailed auction results, especially hammer prices and estimated prices, you will need a subscription – you can get a one-day access for us$32.50/€30. Discover our subscription plans: select "Subscription plans" in the "PRODUCTS" scroll-down menu. 2/ Artpricing, a quick and easy estimation service starting at us$59/€49 only! A team of specialists will return an Artpricing report within 72 h with, that will include, among other things, an estimated price range for the artwork you submitted. This service is exclusively available online and for the following Fine Arts categories: paintings, sculptures, drawings, printsand photographs… No Artpricing reports can be delivered for antiques and items of furniture. To submit an artwork, and see the conditions and bulk purchase prices of the service, click on "Artpricing" in the "PRODUCTS" scroll-down menu..
We kindly inform you that any request submitted by email or postal mail will be turned down.. Please remember that a starting bid out of proportion with the artist's prices may jeopardize the success of your auction ad. Artprice subscribers will bid accordingly to the artist's past auction records, which they can access through their subscription. We recommend that you enter an attractive starting price and remind you that you remain free not to accept the offers submitted on your artwork. You do not need to enter a reserve price as you remain free not to close the deal, should you not be satisfied with the conditions of the sale. We highly recommend that you enter a starting bid that is consistent with the artist's prices for your lot to be attractive to potential bidders. When posting an ad on Artprice.com's Standardized Marketplace, it is important that you list the category of the artwork (mention whether it is a painting, a photograph, a sculpture ...), its technique (oil, gouache ...), its date of creation, its size and any information clear and honest that may confirm the authorship of the artwork. We highly recommend that you include pictures of the artwork: a picture of the artwork ingeneral is a start, but you can also include pictures of details -a closeup of the signature, the artist's workshop's seal, the back of a painting, etc.- and of the authentication certificate. If you do not have the authentication certificate, make sure that you give details on the provenance of the artwork (report if it was purchased at auctions, from a gallery or directly from the artist) or the references of the catalogue raisonné in which the artwork is listed, if applicable. It is essantial to report the name of the person who issued the authentication certificate. This person should be a person of authority on the market of the artist your work is by. You should report the exact references by which your artwork is listed in the catalogue raisonnée and maque sure you include the author(s) name(s), the title, the publisher, the date of publication, the reference of your artwork and the number of the page on which your artwork is presented. Give the exact number of your artwork (example: copy 2/300), and specify if the artwork was signed by the artist or if the signature is part of the engraved design. 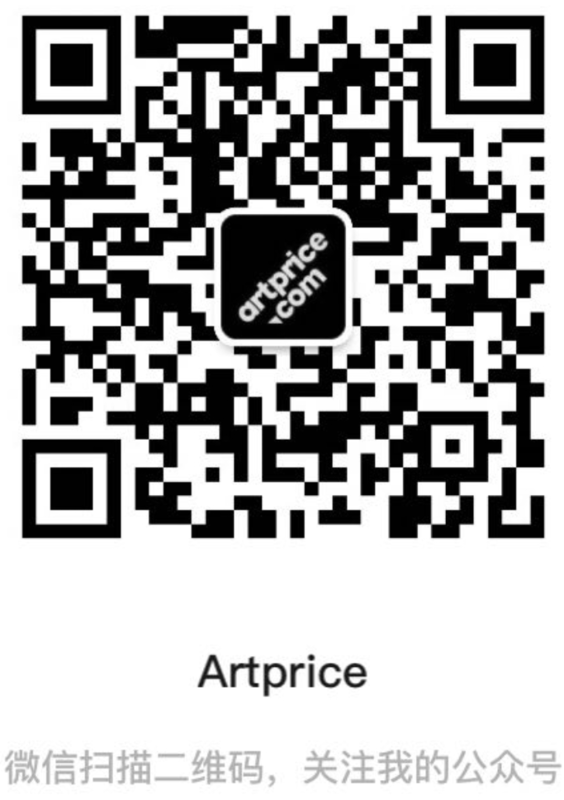 Only will the limited-edition prints and engravings bearing the artist's original signature be posted on Artprice.com's Standardized Marketplace. - "Incoming biddings" to check the biddings you have received. The price shown below the ad will either be the starting price (if the auction hasn't started or if no bids have been posted) or the highest bid. We will send an email each time an offer is posted on your lots at auction (the email will include the amount of the bid and the bidder's country). You may at any given time dismiss a bid or a bidder, in which case the latter will not be able to bid on the lot until the auction ends. After the auction ends, you have 5 calendar days to select one buyer among the best 3 bidders. Find easily the Auction Ads you have posted on the Marketplace: in the top right corner, log in and open your personalized space. Under "Marketplace", click on "My dashboard". The buyers' bids will appear under "Incoming bids". Go to the detailed Ad to select an offer or to decline them all, then, if need be indicate the delivery fees. You are sent an email, by Artprice.com and by the selected trusted third party, as soon as the buyer has started the transaction. You must create an account (if you do not have an account with the selected trusted third party) or log into your account on the website of the trusted third party that the buyer has selected. 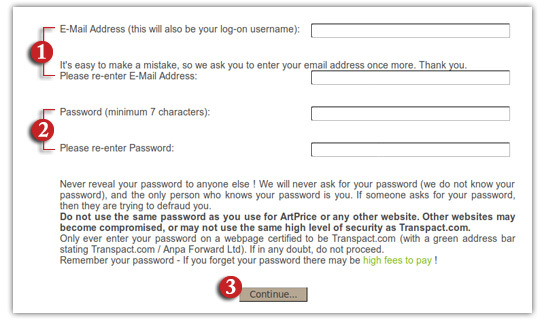 Please note that you must sign in with the same email address as the one listed on your Artprice.com account. You will be presented with a summary of the transaction, including Artprice.com's brokerage fees, and you will be asked to accept the terms of the transaction to continue. If you have not received the trusted third party's email (Transpact.com or Escrow.com), please check the Spam folder of your email account. If Escrow.com is the selected trusted third party and if the payment is to be done in a foreign currency, please check with your bank that they accept to receive payments in foreign ciurrencies. If Transpact.com is the selected trusted third paty: please find hereatfer detailed information on how to create your Transpact.com account. Enter and confirm your email address (which has to be the same as the one listed on your Artprice.com account). Enter and confirm your password (7 digits minimum). Caution, remember your password as, in the event that you lose your password, the reminder procedure is not free on Transpact.com! Click on "Continue" to go to the next step. Enter the 2 words shown in the box (this is a standard security check). If you cannot read the words, you may click her to request a new set of words. Tick the box to accept the conditions of use of Transpact.com and click on "Submit" to confirm the creation of your account. When setting up your Transpact.com account, you will be asked to list your bank account details: Transpact needs to know to what bank account the funds should be paid. The buyer will be asked to make a bank transfer to Transpact.com's account who will hold the funds until the buyer receives the artwork. When the funds are released, Transpact.com will deposit the funds, minus Artprice's brokerage fees, on the bank account listed on your Transpact.com account. Please find hereafter the different steps to list your bank account in "Your Safety Information" on Transpact.com. Enter the details (IBAN and BIC) of the bank account to which you want Transpact.com to deposit the money of the transaction. Tick the box to agree to the terms and conditions of Transpact.com and click on "Submit". Go to www.Transpact.com to get started with the escrow procedure and accept the terms of the transaction: click on "Go" and then on "Agree". If it is your first time on Transpact.com, please note that you will be asked to list your bank details ("Your Safety Information" in "Your Transpact Summary") and to instruct a money transfer of €0.01 (alternatively €1 or €1.5 depending on the minimum amount set by your bank) to Transpact.com. The goal of this money transfer is to enable Transpact.com to verify that the bank details you submitted are correct. This will only be asked once and the amount will be credited back to your bank account immediately upon reception. We kindly insist that this is a requirement for the transaction to be completed. Click on "GO" to go to the detailed information. At the bottom of the page, click on "Agree & Accept the terms". When you first create your Transpact.com account or when you add a new bank account, Transpact.com requires you to instruct a €/$/£0.01 money transfer (alternatively €1 or €1.5 depending on the minimum amount set by your bank). This amount must be transfered from the bank account that is listed on your Transpact.com account. To instruct the €/$/$0.01 money transfer, please contact your bank and provide them with the bank details and reference that were given to you by Transpact.com. You will find the information on the Transpact.com website, in the page where the details of the transaction are presented, as shown below (you will also be sent an email). When your transaction appears as "live and protected", this means that the money paid by the buyer is in escrow. You can contact the buyer to arrange with him the shipping of the artwork: the buyer's email address is sent to you by email and is visible on your Transpact.com account. On the page where the details of the transaction are shown, the buyer's email address is listed next to "Other Party". Once the amount of the transaction is in escrow, you will be given the buyer's email address. It will be sent to you by email and shown directly on the trusted third party's website. You should contact the buyer to ask him to what address the artwork should be delivered. On Transpact.com, the buyer's email address is listed next to "Other Party" on the page where the details of the transaction are shown. Once the amount of the transaction is in escrow, you will be given the buyer's details. It will be shown directly on the trusted third party's website. The buyer will confirm to what address he/she wishes the artwork to be delivered. It will then be your responsibility to arrange for the shipping of the artwork with a shipper or courier company of your choice. We kindly remind you that Artprice.com does not take part in the transaction and that both parties must make sure that they abide by the regulations and laws applicable in their countries, especially as regards to the movement of cultural assets. You may at any given time check thet status of the transaction on the trusted third party's account. I you have sent out the artwork and have not heard from the buyer, please contact the trusted third party. Should any dispute arise, your should contact the trusted third party to work out an appropriate solution. Transpact.com also offers an Arbitration service. The auctions start at the date and time determined by the seller. Only Artprice.com members can bid on lots. To bid on a lot click on "Bid" that appears under the presentation lot you are interested in. The price shown under the ad will either be the starting price (if no bids have been posted), or the highest bid. You will have to bid in the currency set by the seller (a currency converter is available at the bottom of the page). Once your bid is taken into account, it will appear on the Ad. Please remember that bids are anonymous (the seller will only see the city and country of the bidders). If someone bids up on your offer, we will send an email so that you can "Bid" again and up your chances to win the lot. As auction are anonymous, the seller's contact details will not be displayed and you will not be able to get in contact with him or her directly. We can act as an intermediary between you and the seller if you feel you need important information before bidding: you can submit your questionhere. Please make sure you report the number of the lot you are interested in. Keep easily track of the auctions you have bid on: in the top right corner, log in and open your personalized space. From the submenu "My biddings", check the status of the auction and place a higher bid if you have been outbid*. When the auction ends, Artprice will present the seller with the best 3 bidders. If your offer is accepted, an email will be sent to you and the auction will appear under "Winning bids". *You will be sent an email each time a bid higher than yours is posted. After the auction ends, the seller has 5 calendar days to accept or refuse the bids posted on his/her item that are presented to him/her. If the seller chooses you to be the buyer of the item, you will receive a confirmation email. You will then have 2 calendar days to select to which of the two worldwide escrow service companies acting as trusted third parties you will make the payment of the artwork: Transpact.com or Escrow.com (go to section "3. The Trusted Third Parties " in the menus to select from in the left part of the screen). To select a trusted third party, go to "My Dashboard" on the Marketplace, then on the tab "Winning bids" and follow the instructions. Please find hereafter the different steps to create your account on Transpact.com's website. Enter and confirm your email address (which has to be the same as the email address listed on your Artprice.com account). Caution,remember your password as, in the event that you lose your password, the reminder procedure is not free on Transpact.com! If you cannot read the words, you may click on the refresh button to request a new set of words. When setting up your Transpact.com account, you will be asked to list your bank account details; this is essential for the transaction to be completed. Cela vous est demandé pour que Transpact.com sache de quel compte bancaire proviendront les fonds et sur quel compte bancaire vous verser l'argent si vous deviez retourner votre lot et être remboursé(e). In no case shall Transpact.com withdraw money from your account. You will have to instruct your bank to make a money transfer for the total amount of the transaction (including Transpact.com's fees). 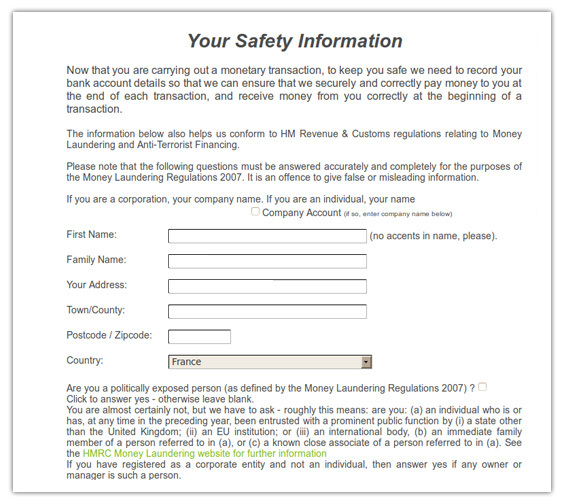 Please find hereafter the different steps to list your bank account details in "Your Safety Information" on Transpact.com. After choosing Transpact.com to be the trusted third party that will escrow your payment, you will be directed to Transpact.com to create your account or log into your Transpact.com account if you already have one. Please remember that you must sign in with the same email address as the one listed on your Artprice.com account. You will be presented with a summary of the transaction, including Transpact.com's fees, and you will be asked to accept the terms of the transaction to continue. Once the terms of the transaction are accepted by both parties, you will have to transfer the total amount of the transaction (including Transpact.com's fees) from the bank account that is listed on your Transpact.com account to Transpact.com's account, on which your money will be in escrow. To instruct the money transfer, please contact your bank and provide them with the bank details and reference that were given to you by Transpact.com. When your transaction appears as "live and protected", this means that the money you have paid is in escrow. You can contact the seller to arrange with him the shipping of the artwork: the seller's email address is sent to you by email and is visible on your Transpact.com account. 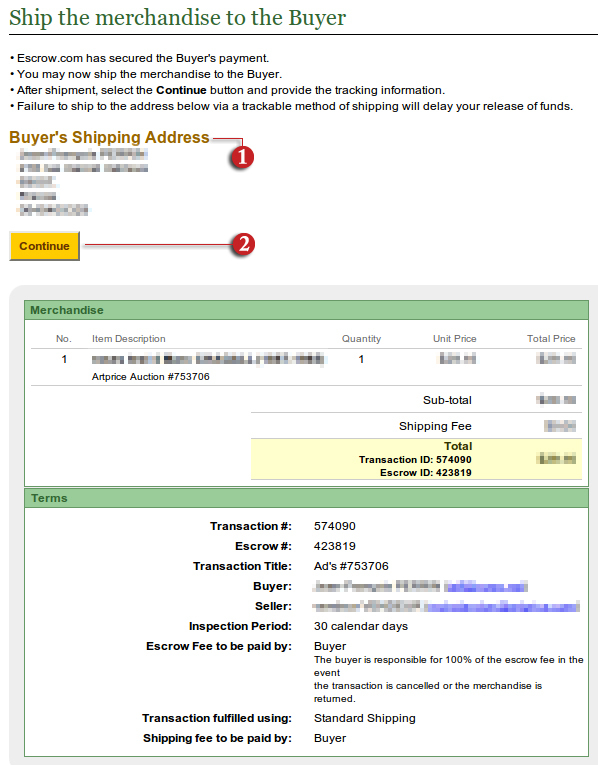 On the page where the details of the transaction are shown, the seller's email address is listed next to "Other Party". Once the amount of the transaction is in escrow, you will be given the seller's email address. It will be sent to you by email and shown directly on the trusted third party's website. You should contact the seller to let him know to what address you want the artwork to be delivered. We kindly remind you that Artprice.com does not take part in the transaction and will not be able to assist you in this matter. On Transpact.com, the seller's email address is listed next to "Other Party" on the page where the details of the transaction are shown. After you receive the artwork, as per the terms of the transaction, you will instruct the trusted third party to release the funds and make payment to the seller. On the page where the details of the transaction are shown, click on "Make full payment to seller" to release the funds. Click on "Authorisation Instructions" to get the instructions on how to confirm the release of the funds by instructing your bank to make a €/£/$0.01 money transferto Transpact.com's account. When you instruct Transpact to release the funds and make payment to the seller, you are asked to instruct a a \u20ac/£/$0.01 money transfer to Transpact.com (alternatively \u20ac1 or \u20ac1.5 depending on the minimum amount set by their respective banks). This money transfer must be instructed from the bank account listed in your Transpact.com account. This is a security routine, which goal is for Transpact to have th confirmation that it is the owner of the bank account who requested that payment be made. This last money transfer will be credited back to your account upon reception. Make sure that, when giving the instructions for the money order, you quote the reference given to you by Transpact. If this payment is not done properly, the funds will not be paid to the seller and the seller is very likely to start an "Arbitration Proceeding". Please contact the trusted third party who will let you know what to do in case you and the buyer disagree. The trusted third party will let you know the arbitration procedure. Why put the payment in escrow? For the payment of items sold through the auction system on Artprice.com's Standardized Marketplace you can choose from 2 worldwide escrow service companies acting as secure third parties: the payment is escrowed by the secure third party until the buyer acknowledges receipt of the item. If the item is not delivered or if the sale is cancelled, the sum is returned to the buyer. - the buyer gets his/her money back if the artwork is not delivered or if the transaction is canceled. It is up to the buyer to select the secure third party - the secure third party's fees are at the buyer's expenses. Transactions on Transpact.com are to be settled in € (EUR), £ (GBP) or US$ (US dollars). Transpact.com's fees are at the buyer's expenses, as it is up to the buyer to select the secure third party. When setting up your Transpact.com account, you will be asked to list your bank account details. Both buyer and seller must comply with that step of the process for the transaction to be completed. Transpact.com is not entitled to withdraw money from your account - any money transfered to Transpact.com will be after, and only after you have instructed your bank to do so. The seller will have to instruct that a money transfer of €/£/$0.01 (alternatively €/£/$1 or €/£/$1.5 depending on the minimum amount set by their respective banks) is made to Transpact.com's account. This amount must be transfered from the bank account that is listed on your Transpact.com account. The goal of this money transfer is to enable Transpact.com to verify that the bank details you submitted are correct. 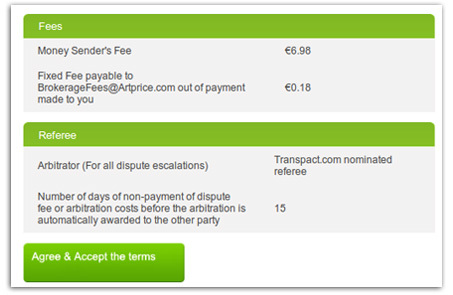 When you first set up your account with Transpact.com or when you add a new bank account, Transpact.com requires you to instruct a €/£/$0.01 money transfer (alternatively €/£/$1 or €/£/$1.5 depending on the minimum amount set by your bank). This amount must be transfered from the bank account that is listed on your Transpact.com account. To instruct the €/£/$0.01 money transfer, please contact your bank and provide them with the bank details and reference that were given to you by Transpact.com. When a transaction appears as "live and protected", this means that the money paid by the buyer is in escrow. The buyer and the seller can contact each other to arrange for the shipping of the artwork: the email addresses are sent by email and are visible on each party's Transpact.com account. On the page where the details of the transaction are shown, the other party's email address is listed next to "Other Party". When you instruct Transpact to release the funds and make payment to the seller, you are asked to instruct a a €/£/$0.01 money transfer to Transpact.com (alternatively €/£/$1 or €/£/$1.5 depending on the minimum amount set by their respective banks). This money transfer must be instructed from the bank account listed in your Transpact.com account. Transactions on Escrow.com can be settled in US$ (US dollars) or € (Euros). All sales that might be closed on Artprice.com in £ will automatically be converted into the currency selected by the buyer. Escrow.com's fees are at the buyer's expenses, as it is up to the buyer to select the secure third party. We kindly inform you that Escrow.com charges additional fees on payments in US$ (US dollars). Also, additional fees may be applied by your bank if you do not hold a bank account in US$ (US dollars). Go to www.Escrow.com to get started with the escrow procedure and accept the terms of the transaction. You can view the status of your transaction in “My Transactions”. If the status reads “Review and agree to terms” (1), this means that your accepting the terms of the transaction is still pending: please review and accept the terms of the transaction. 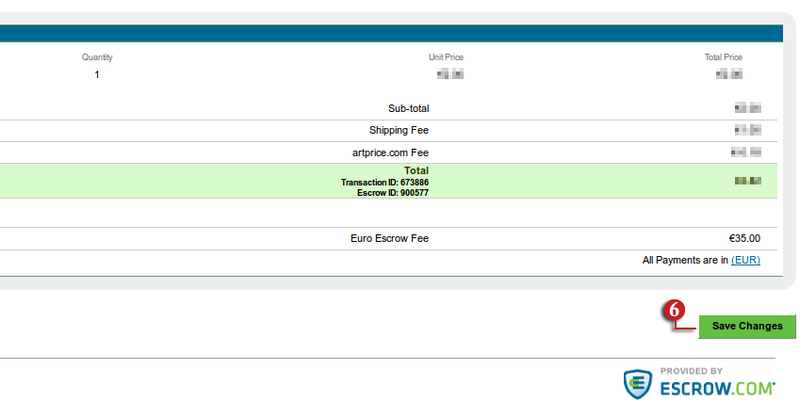 You can check the total amount (2) that you will be paid after Artprice's fees are deducted (1). The Escrow.com fees (3) are displayed for your information only as they are paid for by the buyer. 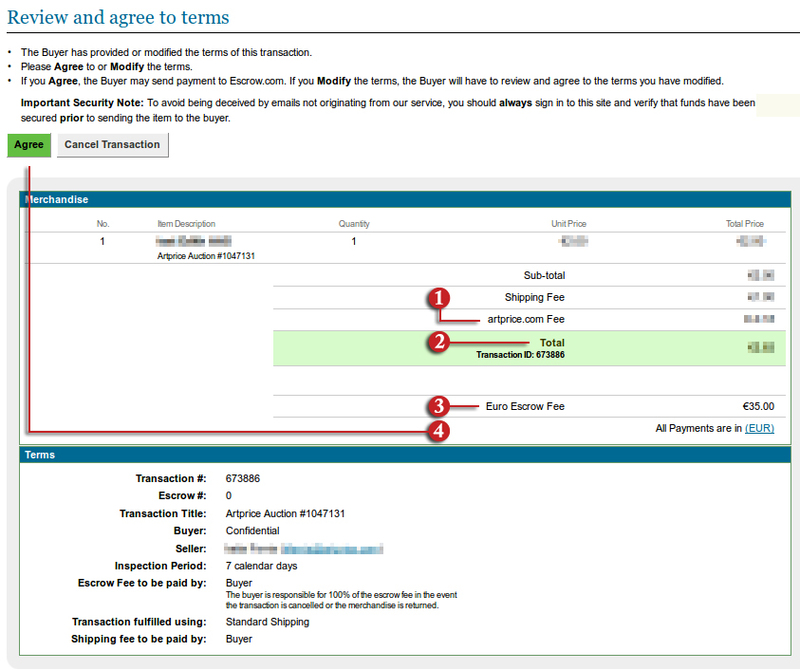 Click on "Agree" (4) to accept the terms of the transaction. On the next page, you must read and accept the Escrow instructions. Click on "Agree" (1) to accept the Escrow instructions. The payment is done exclusively by bank transfer: click on “Euro Wire Transfer” to accept this payment method. 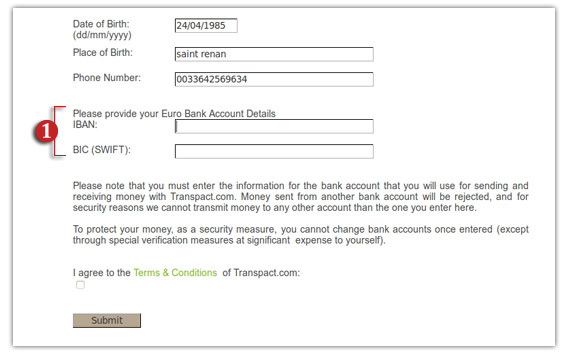 On the next page, you will be asked to enter the details of the bank account to which you want the money transfered. Enter the bank's full address. After you have listed the required information, click on “Save Changes” at the bottom of the page. As soon as Escrow.com receives the payment, you are sent a confirmation email. You can go to Escrow.com to get the buyer's contact details (1). Click on “Continue” (2) to proceed with the transaction process. You will be asked to list the tracking information. Enter the name of the courrier you have chosen (you are presented with a list – should the courrier you have chosen not appear in the list, select “Other”). Enter the parcel's tracking number. If you have chosen a courrier not listed by Escrow.com, you will be asked to provide the company's name and phone number. Click on “Submit” to save the listed information. You will be sent an email to let you know when the item was delivered to the buyer. The inspection period will start from the moment the item is delivered. You have nothing left to do, except wait for the email that will be sent to let you know whether the buyer has accepted or refused the item. Check the listed shipping fees. Please note that you are to pay the Escrow fee. Click on "Agree" to accept the terms of the transaction. In "My Transactions", if the status reads "The seller has to sign in to review and agree to the terms", the seller has not yet accepted the terms of the transaction. You have nothing to do, but wait for the seller to accept the terms of the transaction. Escrow.com will send you an email with instructions on what to do after the seller has accepted the terms of the transaction. 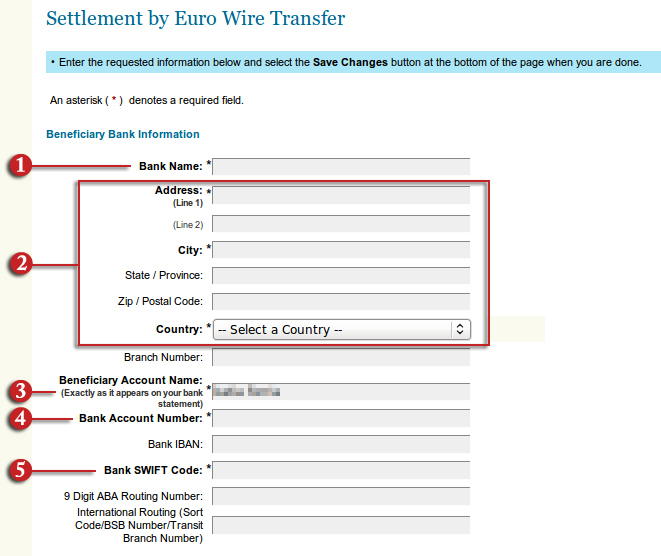 Click on "Select and Print WT Instructions" (2) to print the payment instructions to submit to your bank. Escrow.com will secure the payment as soon as it is credited to their account, which takes an average delay of 2 days. You will then be given the buyer's contact details so that you can contact him/her and arrange for the delivery. if the merchandise is consistent with the description of the Ad, release the funds: go to the detail of your transaction and click on “Accept” (1) to confirm that you accept the merchandise. After you have accepted the merchandise, the transaction is closed. Both you and the seller will be sent a confirmation email. if the merchandise is not consistent with the description of the Ad, you can file a claim: click on “Reject” (2). On the next page, in section “Reason for rejection” (3), choose the reason why you do not accept the merchandise. The Artprice.com are at the seller's expenses: the amount is deducted directly from the funds paid to the seller and is credited automatically to Artprice.com's account.